In 1994, Eric Clapton came across a Wayne Henderson guitar in a recording studio and decided on the spot that he had to have one. Rarer than Stradivarius violins, these musical works of art are built from near-extinct Brazilian Rosewood, Appalachian spruce, black ebony, and fine mother-of-pearl. With Henderson's keen ear for the vibrations of each piece of wood he uses, each note that comes out of them has the power of a cannon and the sweetness of maple syrup. In "Clapton's Guitar," Allen St. John recounts how a perfect acoustic guitar comes into the world and how an artist gauges perfection. Wayne Henderson, master luthier and genius in blue jeans, will tell you that he simply puts penknife to wood and carves away "everything that isn't a guitar." This is the story of a master artist, set deep in the mountains of southwestern Virginia in a brick, one-story guitar shop, as busy and chaotic inside as it is simple outside. The space is well-lighted, cluttered with power tools, air hoses, and guitar bodies in various stages of completion. It is in this modest shop that Wayne Henderson crafts some of the most highly coveted acoustic guitars on earth, including one very special instrument he built for Eric Clapton. Normally, there is a ten-year wait for a Henderson guitar, and St. John finds there are no exceptions even for an iconic figure like Clapton. But seeing it as a shortcut to getting his own guitar done, St. John jump-starts the process, and then takes readers with him on a mesmerizing journey into the heart of high-end instrument making with the man "The Washington Post" calls the "Mad Scientist of Mountain Music." 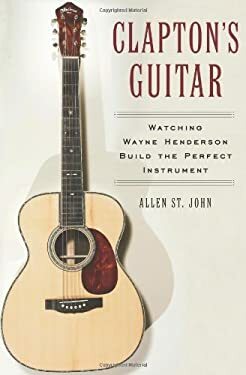 Henderson, a small-town wise man, is not only the star ofthis book as a master guitar maker but also is the star of any stage he sets foot on as a master guitar player, equally at home at Carnegie Hall or the local VFW hall. Around this drolly humorous man circulates a small coterie of colorful characters and inspired musicians, who welcome you for an all-too-brief visit. By book's end, you too will want to be Wayne Henderson's friend. In a rich tapestry of folklore and folksiness, St. John tells the story of building the Clapton guitar in loving detail, from the centuries-old forests where great tonewood grows, to the auction floor of Christie's where one of Clapton's guitars commands over $700,000. It's also a loving look at Wayne's corner of the world, the Blue Ridge mountain hamlets where American traditional music was born, and of Wayne's hometown of Rugby, Virginia, population 7, where the winding roads have kept progress at bay. Whether you love old-time music, unplugged rock, traditional American craftsmanship, or simply gifted storytelling, Clapton's Guitar is an engaging work that you will want to savor and share with friends.